Very Large Array - Solar System Planets And Moons Section. 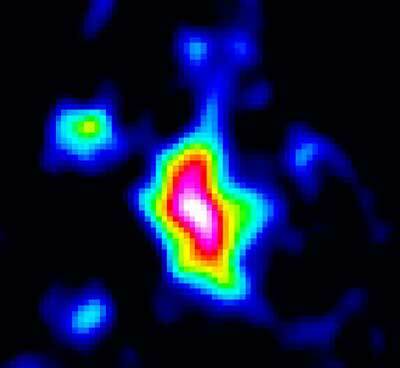 Very Large Array have discovered a distant Galaxy. What Will Huygens probe Land In?. Cassini's close flyby to Titan in October has only added to the mystery of what the Huygens probe will find on the moon's surface when it tries to land in January. It could land on a hard surface of rock and ice, or maybe it'll land with a squelch into a slurry of organic materials, or maybe it'll splash down into a hydrocarbon lake. Fortunately, the probe is designed to handle all three landing surfaces, and it should be able to transmit details about Titan as long as it survives. Black Holes or Galaxies, Which Came First?. Since supermassive black holes were first discovered, Astronomers have been wondering if the hole was created first, and then the Galaxy formed around it, or if these monsters tend to form at the heart of Galaxies over time. Astronomers using the National radio astronomy Observatory's Very Large Array have discovered a distant Galaxy that's less than a billion years old, but seems to have a supermassive black hole - but no massive bulge of stars. The black hole is 1 billion solar masses, so it should be surrounded by several trillion solar masses in stars. This provides evidence that it's the black hole that forms first, then the galaxy. A Soyuz 2-1a rocket lifted off from the Plesetsk Cosmodrome in Russia yesterday, completing a test of this modernized version of the launcher. It was carrying a mock-up of an unspecified satellite called Oblik. The Soyuz 2 is more powerful that the earlier model, and equipped with a digital control system, requiring less people to oversee its launch and monitor its flight.